We have a nice stall on the corner of the main road that sells all sorts of sweet sticky stuff. This sticky rice stuff is great, much better than giving the kids a stick of rock. As she is on the main road she obviously gets a lot of business. here is the old sausage and squid bbq stall. Maybe it's not match with this thread but I just don't want to start a new thread. Last weekend, I passed Silom Rd. and I saw many people were on the row, waiting to buy something from the shop named "Rotiboy". Someone said it's cookie or something like that (forgot). I just wondered if it's very good taste because many people wanna eat it. Have anyone here ever tasted it? How's it like? I love those Issan sausage balls. I passed a stall like this one on my way home last night and bought a few for a quick snack. They can tast a bit nasty on their own, but with a bit of cabbage and ginger they're delicious! I realise this is the thai foodstall thread, but the owner is Thai, I reckon this guy makes more money than any other 10 Thai food stalls added together. yep mr Kebab man, he's had the same spot in south Pattaya now for the last 15 years at least, the chicken kebabs are 60baht and the lamb kebabs 70baht. Does he sell Lamb kebabs to Thais? My wife will eat lanmb now, but when she first came to the UK she wouldn't touch it. We have some Thai friends and if we serve lamb to them the missus tells them it is some odd cut of beef. I used the beef angle on a friend once and had a great leg of lamb. While I was carving more in the kitchen someone let on that it was lamb. The dumb dumb threw up at the table. The customers are mainly farang and arabs, can't imagine a Thai buying a kebab when they can get Tom Yum Krung for the same price. Have you talked to him about building him his house, he must be making a damn good living. I think he built his mansion a good few years ago, his patch connects to walking street, it wouldn't suprise me that on his worst nights he makes more than 5,000baht profit per night, anyway next up we have the thai version of a beef burger and hot dog lorry, they actually aint that bad considering how cheap they are. I will always believe that the food in Pattaya is much better overall than BKK. Plus you can go anywhere to Pattaya or Jomthien in less than say 40 minutes even in bad traffic, and that would be North Pattaya to South Jomthien. Last Night I even saw 2 fish and chip stalls, although I have to admit the fish don't look like nothing like fish you get in a restaurant. Maybe it's not match with this thread but I just don't want to start a new thread. Last weekend, I passed Silom Rd. and I saw many people were on the row, waiting to buy something from the shop named "Rotiboy". Someone said it's cookie or something like that (forgot). I just wondered if it's very good taste because many people wanna eat it. GoW, I havent had any of these, but I have been standing in the skytrain and someone has got on with a bag of them and they smell delicious. Both a warm bread smell and coffee. I would like to try them but I wouldnt wait in a line for hours to do it. Anyone ever had the fried sweet patatoes? MMMMMMMMMM Alloy! Dont under any circumstances look at the oil they are fried in, same goes for the bananas. the chicken kebabs are 60baht and the lamb kebabs 70baht. Are you sure it's lamb? Here the usual kebab is made of veal. They just introduced chicken kebab when BSE occured. Actually I believe it's mutton, but hell whats in a few years. While you are answering questions, I still cannot open your viedo files with WMP while any other videos I have no problems. I had dinner lastnight at the food stalls on sukhumvit 38 - which is apparently one of the best places to experience street food in BKK. Fish glass noodle soup and dim-sums - bladdy great it was. 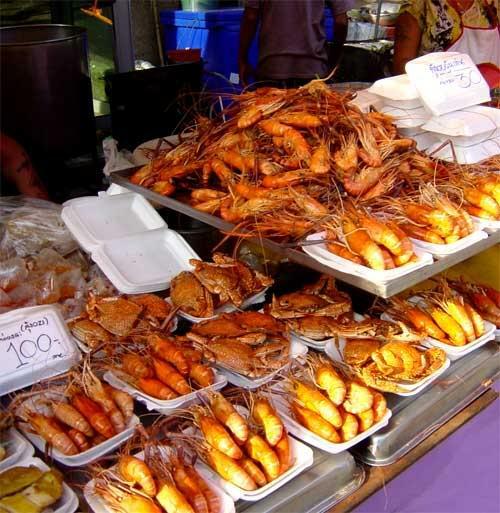 Will try and gets some pics next time, but meanwhile here's a pic I took last year which will make our over-seas sea-food eaters green with envy.. 100baths for 10 king prawns folks! It's a bakery chain, GoW.....and is very popular with my japanese friends. They all say they sell delicious pastries + cookies, and apparently you don't have to line up for so long now that the hype is over since the new stores opened in BKK..
You've gotta try sushi, icey. It's taste bud heaven.